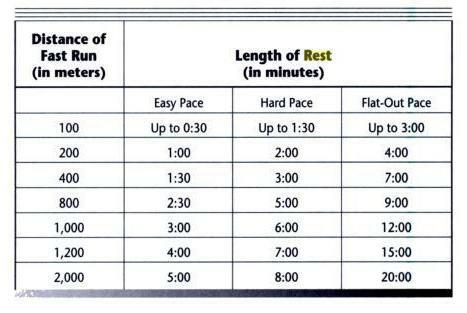 I checked out "Run Fast: How to Train for a 5-K or 10-K Race" by Hal Higdon from the library yesterday. Repeats - Higdon defines a repeat workout as one in which you run very fast, usually over a very short distance, and take a relatively long period of time to recover before repeating that distance again. Interval Training - According to Higdon, the difference between running repeats and doing interval training is that in interval training you control the rest interval between the fast runs as well as the speed and distance you are running. The most common interval distances are between 200 and 800 meters. Fartlek - You pick some landmark such as a tree or bush and sprint to it, then jog until you've recovered. Up-Tempo Running - The purpose of this type of running is to increase your anaerobic threshold. Aerobic is when sufficient oxygen is delivered by the cardiovascular system to maintain a steady state of energy production through the breakdown of glycogen whereas anaerobic is when the exercise is so intense that the cardiovascular system cannot provide sufficient oxygen for efficient energy production. Lactic acid begins to accumulate in the muscles and bloodstream. For up-tempo running, you start with a warm-up (20% of the total run time), run hard for (70% of the time), and then cool down (10% of the time). Throughout the book, Higdon also discusses using maximum heart rate (MHR) and VO2 max to identify workout intensity. VO2 max is the maximum capacity of an individual's body to transport and utilize oxygen during incremental exercise. Since I don't currently own a heart rate monitor, I will not concern myself with MHR percentages right now.